As an everyday driver, your vehicle’s electrical power source will eventually fail. Whether it’s a drastically temperature change, the water level of the battery is low, or the battery just simply won’t hold charge like it used to… these things happen all the time. In order to be prepared, you need to have a jump starter box on you at all times. It’s one thing to have cables, but what happens when no one is willing to stop and help you out, then what? We created a guide specifically about battery jumper boxes, portable jump starters, and anything that you can take with you to give your vehicle’s battery the “extra” juice to get going. Now, before we dive into the top 10 list lets go over what the requirements USED to be. Before the jump box, you had to carry with you a set of jumper cables to get another vehicle to give you some juice. This is still a common practice when no other power sources are present, but it’s quite an inconvenience. Then we have the jump boxes on wheels where you hook them directly to the wall and then directly to the car battery. This again requires a power source which is a wall outlet, even more inconvenient. Today’s latest options are MUCH better in terms of providing power and portability. Some of today’s best jump starters weigh under 5 lbs in total and can give you over 15 jumps on a single charge (WOW!). Battery jumper boxes aren’t out of reach financially, your local automotive store and places like Amazon’s Automotive section will have a plethora of choices. 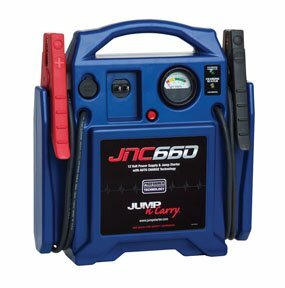 We narrowed it down to just TEN of the best rated, and best performing portable jump starters you can get. Take a look! 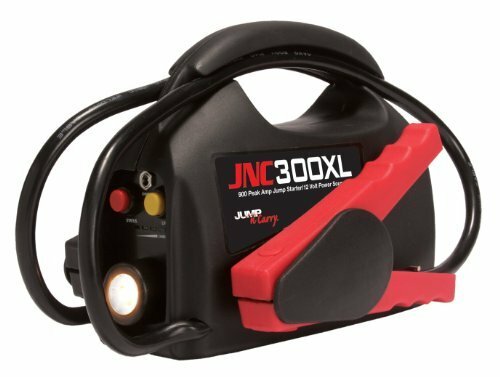 First contestant we have in our #10 spot is the Jump-N-Carry JNC300XLC Portable 12-Volt jump starter. This little guy isn’t by any means the smallest package you can get for jump starters, but it’s 1/3 of the size a regular jumper box is. This one comes in weighing in at around 9l bs fully loaded, it includes two jumper wires and a convenience light (ideal for night time usage). This one in particular has the “C” in the end of its name, meaning that its Oregon and California energy compliant. At peak power its pushing around 900 amps, and for cranking amps you’re looking at around 225. When hooking this unit up to a battery, each lead (negative and positive) provide around 27″ inches of reach. In addition, you’re also provided with a 12-volt socket (cigarette light style) for powering up and charging your electric accessories. Overall it’s a VERY popular unit and has received great feedback from its users. If you don’t live in California or Oregon, you can save close to 30 dollars by looking into the JNC300XL (non-energy compliant unit). Same performance still. Here we have a jump starter that is very similar to the one mentioned above, but this one is taking a more traditional approach in terms of design. The Performance Tool W1665 is a full 900 peak amp and 400 cold cranking amp jumper box, featuring an additional tire inflator. What makes this unit great is the relatively easy portability aspect, along with a tire inflator making it a useful tool in two aspects. There’s a comfortable rubber grip done on the top of the handle, making it easier to carry around. Weighing in at just over 14 lbs, it’s by no means the heaviest thing you’ll carry.. quite the opposite actually. 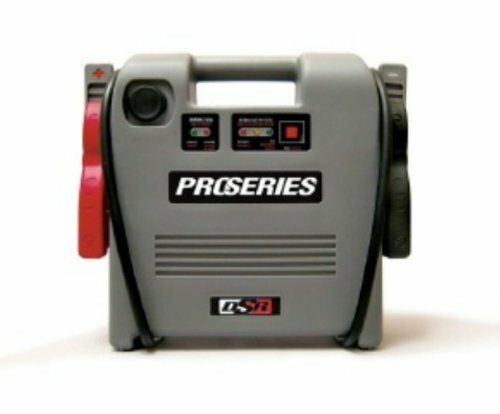 Additional useful features that come built-in are: reverse polarity warning light allowing you to stay away from hooking up the battery in an incorrect fashion, three level LED lights indicate the life of the battery and when it’s time for you to charge, lastly there’s a 24″ inch inflator hose which can compress air up to 300 PSI. In conclusion, this is a great package to place in your trunk and have in case of an emergency. We’re now stepping into the most modern method of jumping a car or truck’s battery. 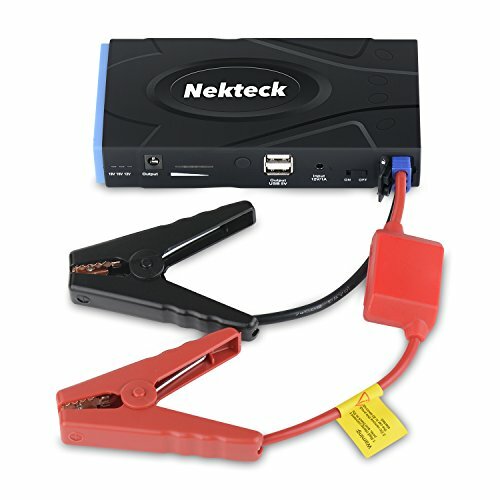 Nakteck has created a portable power source that has the capability of reaching 600 peak amps with 16,800 mAh of battery juice. Crank over a gasoline engine of up to 5.0L inside, or crank up a diesel engine that’s up to 3.0L in size. What else makes this really that great? The overall size and weight is 6.5″ inches long, 3.1 inches wide, 1.6″ inches high and weighing in at just over 2 lbs. Place it in your glove box, or place it in your trunk to be hidden away until it’s time to jump. Aside from its size, it boasts quite a few very useful features which you’ll most likely end up using more often than not. With the battery fully charged, you’ll be able to jump start up to 25 times before needing to recharge this portable battery (imagine how often you’ll need to jump-start a vehicle or vehicles, 25 times… this may take a while). On the unit itself it has 2 USB ports, along with multiple adapters for charging electronics. Overall, being able to jump a battery up to 25 times, weighing in at around 2 pounds, and spend half of what a conventional jump box would cost makes this unit WORTH IT. If you want something heavy duty, a traditional styled jump starter box is the way to go (in most cases). 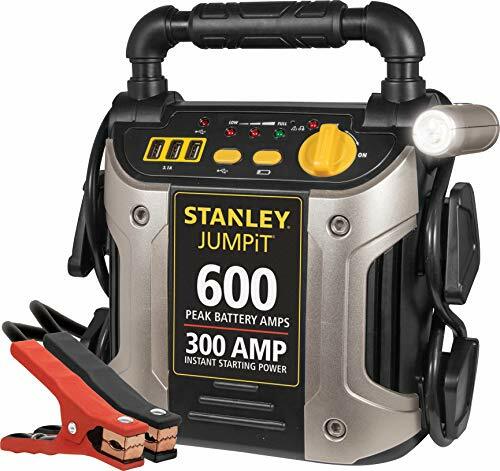 Our #7 is the Stanley J5C09 Jump Starter Box. Stylish in looks, this portable jump box comes with not just a power source but also a air compressor that can be used to pump up tires (120 PSI max). When it comes to power, you’re looking at a whopping 1,000 peak amps and 5000 cold cranking amps for instant starting power. A USB and DC port are included for charging up your electronic accessories. In addition, there’s three LED lights indicating the current status of the battery and a reverse polarity light indicating when terminal hook-up is done incorrectly. Weighing in t around 18 lbs, it bears the typical weight you’d find in most other jumper boxes. If you want heavy duty power, especially for trucks and SUV’s, look into this Stanley J5C09. The above-mentioned jumper box is designed for heavy duty vehicles, but our next here steps it up a notch. Schumacher XP2260 is a portable power source which enables you to reach 1,200 peak amps of cranking power, ideal for heavy-duty engines and vehicles. Very stylish in design, it features a wide range of accessories such as a USB port for charging electronics, two 12-volt inlets, two 120V AC outlets, a built-in air compressor, and a built-in air inflator/deflator. Being a bit more high-tech, there’s a digital display indicating the current status of the jump box, telling you exactly when it’s time for a charge. You can charge this jump box by using most types of extension cords, just hook it up directly to the back and plug the other end into the wall. Lastly, there’s a convenience light located right above the digital display, this makes it a great unit to be used at night when tough to see. Also the battery itself is maintenance-free by being sealed, this makes it possible to store it in any position. Heavy duty jumper box is what you’ll be getting, along with a few extra bonuses that truly help. 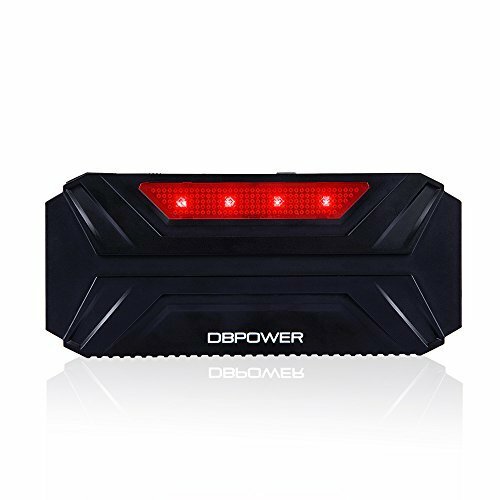 Moving down to another even better ultra-portable jumper box, we have the DBPOWER DJS30 Car, Phone and Laptop Power Pack. What makes this unit quite impressive is the compatibility and the power output that it provides. Right from the box, you’ll see this unit comes in a convenient soft case which also stores all of the included accessories. This unit is meant to be brought with everywhere and to have all of the things it comes with at all times. Unlike the previous unit, this guy weighs in at just over 1 lbs, which is incredibly light weight. In addition, the overall length is 7.5″ inches, 1.9″ inches in height, and 3.4″ inches in overall width. This unit includes a series of RED led lights located on one side, as well as a ultra-bright white led light located on the front. With the 16,500 mAh of power and 600 amps of peak power to get your vehicle cranking, you’re looking at roughly 20 or so full jumps before needing to recharge this pack. Essential accessories like the positive and negative terminal are created in a way that you won’t easily touch both terminals accidentally. Also, the USB port and additional charging terminal can be used to charge a wide range of laptops and electronics. Just throw this unit into your trunk storage area OR, place it in your glove box. It’s not just for jumping your vehicle, it’s for jumping everything else too. Being the smallest in the family but still being a very high peak amp jump starters, we have the Schumacher PSJ-1812 ProSeries portable jump box. What sets this jumper box apart from everyone else (mentioned above) is the peak cranking amps you’ll have access to. This unit in particular isn’t the full sized box like its 2,200, 3,600, and 4,400 peak cranking amp brothers. Weighing in around 18.6 lbs, it’s portable enough to store in the back of your vehicles trunk (cubby or storage area) and keep with you in the case of an emergency. Aside from the peak amps, it has 280 cranking amps and 225 cold cranking amps. An 18 amp hour professional grade high output battery is easily rechargeable using the port inlet found on the unit. Unlike the other units previously mentioned, there isn’t much in terms of accessories. For the most part, this is mostly barebones. Great for high power requirements but in a small package. 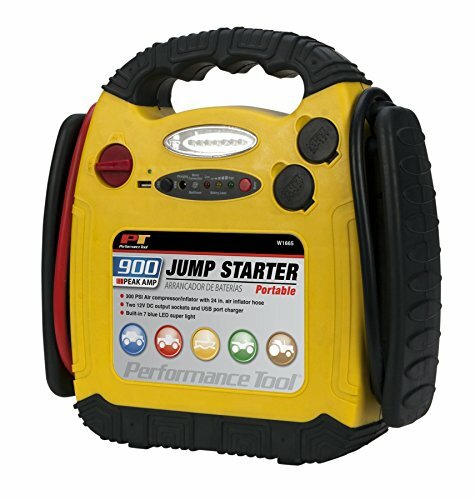 This product in particular is one of our most favorite jump starters on the market hands down. You’ll end up paying price for it, but it’s quite amazing at what you can do with it. First off, the NOCO Genius Boost HD is a 12-volt 2,000 peak amp portable jump starter. What this means is that it can jump a vehicle up to 40 times on a SINGLE charge… how’s THAT for impressive.. For all of that power it’s very small in size and weighs under 3 lbs. You can jump gasoline vehicles that have engines up to 8.0 liters and diesel engines that are as big as 6.0 liters (in most cases people have reported being able to jump diesel engines that are bigger). The spark-proof technology protects you from reverse polarity, and the terminals are easily tucked on the unit for a very convenient package. 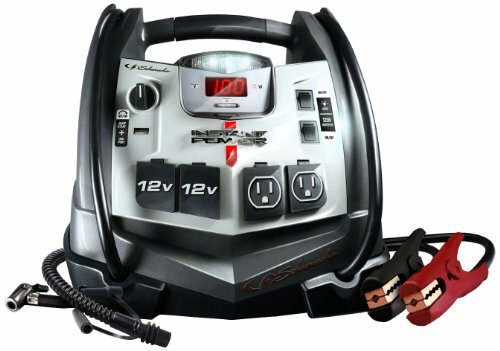 Some additional bonuses you’ll get with this unit are a 12 volt power port for tire pump, power-converters, lights and other things, you’ll be able to charge electronic devices using the built-in USB port, and even use the 400 lumens LED flashlight with the 7 modes (including SOS and Emergency Strobe). It will be hard to get stranded with a dead smartphone, on a full charge you’ll be able to recharge a dead smartphone up to 8 times. With all these features, you can easily hide this device in your glove box or cubby and use it when desired. Highly recommended! Undoubtedly one of the best selling traditional styled jumper boxes online right now is the Jump-N-Carry JNC660C starter box. This unit in particular is designed to be used on the go in practically any vehicle you can throw at it. The most basic design is well put together and features the necessary parts to get the job done. Probably the most admired aspect about this jumper box is the minimalist design with no additional accessories that drain from the battery. In terms of power you should be looking at 1,700 peak amps and 425 cranking amps to start passenger vehicles and light to medium duty trucks. Both negative and positive terminals are 46″ inches in length and are of higher gauge wire, making them very durable and not likely at all to get torn. You can recharge this unit from the front, as well as see the current battery status with a crisp, clean analog gauge. Over 2,160 individual user reviews have given this jumper box a VERY impressive rating overall (4.7/5.0). Check it out below on Amazon. So now we’ve come down to the best jumper box to get, and this one was a tough choice. Although there’s a TON of positive reviews for #2 and a few similar traditional styled jumpers, our #1 won for a few different reasons. Suaoki G7 Portable Car Jump Starter is by far the most powerful (very portable) jump box unit we’ve come across. This one in particular has 18,000 mAh power supply which enables you to jump start a vehicle (gas up to 5.0 Liters and 3.5 Liters for diesel) up to 22 times on a single charge. Now, this unit is only about 3 lbs in total and is no more than 7.3″ inches long. You get a beautiful digital LCD display showing you the battery status indicator, along with 2 USB ports, a power OUTPUT, and a ultra bright white LED light. There’s reverse polarity protection to protect the car and portable battery. Under 100 dollars, grab it from Amazon and get a warranty. How to jump start a car, step by step..